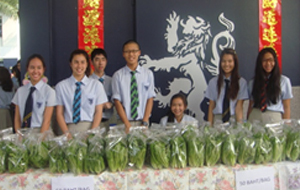 “Veggies from the Heart” is the first project of the Lionheart Society. 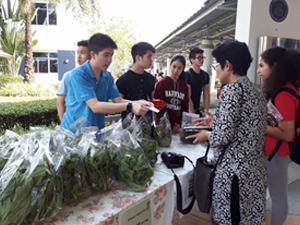 Our primary objective in selling organically grown vegetables at school was to raise a substantial amount of money to help a village school in the province of Nakhon Ratchasima. Luckily one of our members, Pat Yontrarak has a small plantation which grew a variety of fruits and organic vegetables, therefore these were readily made available to us for this project. 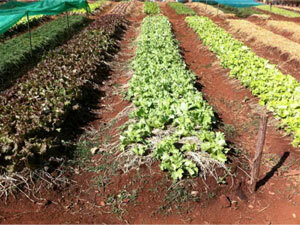 Why Organic Vegetables? 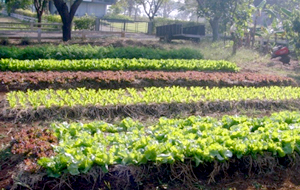 Since it is common knowledge that organically grown vegetables are safer for the environment and more beneficial to one’s health rather than those which are conventionally grown, our decision to sell these items proved to be more valuable for this project. "Many sales were conducted this school year … at Harrow School, office buildings, clinics as well as direct orders from other customers. Total sales amounted to 109,150 Baht..."
"For this season’s sales, there has been a slight delay in our harvest due to the late arrival of the cold weather in the country. Normally, the cold period is expected to commence..."
"Eight sales were conducted this school year…at Harrow, office buildings, clinics and direct orders from other customers. 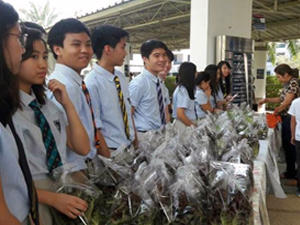 Total sales amounted to 86,500 Baht..."
"Our initial sales were conducted at school and due to its success, we expanded our market elsewhere such as offices, clinics and restaurants.."
"The Lionheart Society has been selling organically grown vegetables in order to raise funds to support our various community projects earning 76,400B from sales." "Four sales were successfully performed and the amount raised..."
"The projects funded by the vegetable sales are Paws for a Cause..."
This project, being the very first that we planned for, gave me a bit of uncertainty since I was quite unsure if our organic vegetable sales would be accepted and appreciated by everyone. Surprisingly, it actually worked! We were able to raise a substantial amount of 87,200 baht just from four sales during the year. This money was intended to support our other planned projects, in particular “Paws for a Cause”. 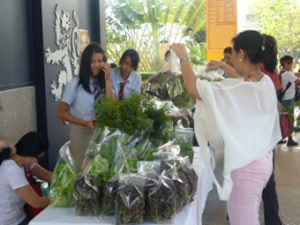 Our first opportunity was selling vegetables, “Veggies from the Heart”. 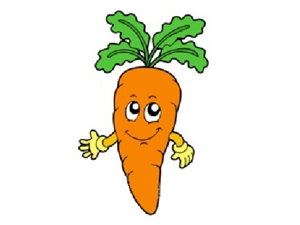 I never realized how important vegetables are in our lives and how hard it is to find good and clean vegetables nowadays. With the sales, we have raised over 80,000 baht in total. 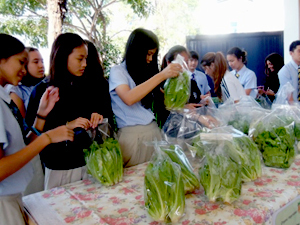 The Lionheart Society’s first project was “Veggies from the Heart” where we sold organic home-grown vegetables to parents, students, and staff ofHarrowInternationalSchool. I am delighted that we have been able to raise over 80,000 baht to contribute to the Lionheart Society’s funds which we have used for other projects. 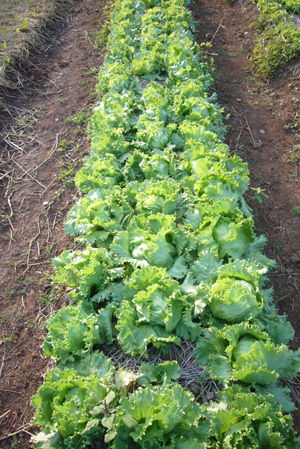 The first project The Lionheart Society started up was “Veggies from the Heart”. 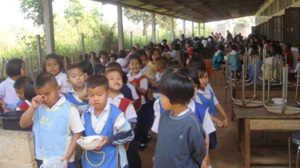 It is our objective to offer academic and physical education to students in the poor provinces and villages. 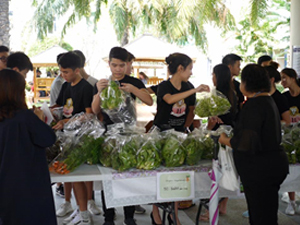 The vegetables were sold after school by our group, in order to raise money to help our target school “Baan Nong Taa Kaew”, which is located in theprovinceofNahkon Ratchasima. We managed to raise enough money to build the school better sinks and a better Football Goal. The remaining money was used to buy Book, Shelves, Computers and Basketball Hoops with an extension to the court.